1. 3dimka I know this is supposed to be a scorpion of sorts but i cant see the crosseyed ones as easy as i the others. is the scorpion supposed to go into the backgroud or pop out from it? 3. Wow how fascinating! 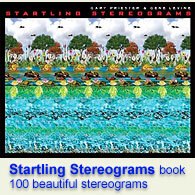 I understand the theory behind this type of stereogram but I ve never encountered anything like it before. I m having a little difficulty making the image appear but I m sure I get it. 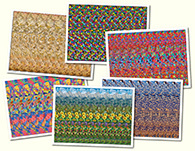 br br Hey just a suggestion you should make the hidden code for these cross eyed stereograms out of a cross eyed stereogram. That way you know for sure that only the people who can get it get to comment. 5. Looks like I m a cross-eyed type. Viewing this stereogram is completely natural and instinctual for me where as the other type take constant god-like concentration to maintain. Interesting. 7. I saw it as both cross eyed and the other way with the image being reversed into the background which was pretty crazy. br br Also I think this Hidden code should replace Captchas accross the Internet. 9. I can t see the crossed eye stereograms :( but making the code hidden is absolutely genious! Haha. 10. Now I saw it!!! 16. Im in a secret club :) but cant computers read this? 17. daaaaahhh.why didn t i think about looking at the hidden code cross eyed as well instead of fighting to switch. 20. Cool First time I seen a cross eyed one. 30. i can t see this one..
43. I ve never been able to see these before tonight... 30 years old and I can finally see images in them. 48. It s a scorpion that pops out of the backround. These pics are my fave. 51. finally mission complete. br a scorpion with 6 feet 2 whiskers and 2 claws and tail effuse slightly toxic fluids.